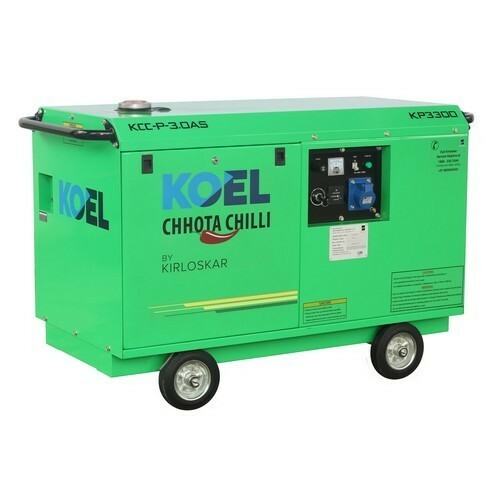 KOEL Chhota Chilli Portable Petrol Gensets come from the house of Kirloskar, having more than seven decades of experience. KOEL Green and KOEL Chhota Chilli have over 1 million Gensets in service across the globe. When it comes to Power, no one knows Gensets better than KOEL. With the highest rated power in the segment, user friendly KCC Petrol Gensets with superior durability reliability ensures smooth and clean power to several connected devices. KCC rolls on wheels and is equipped with a wide length handle. Mobile power backup can be convenient both for business or pleasure. From construction sites to wedding celebrations. This feature is of great help for small establishments and mobile workshops too. Enjoy the benefits of mobility and portability! Requirement of power backup varies from simple lighting to air conditioning; from computer systems to refrigeration; for small offices, clinics, restaurants to bunglows. 2.1 KW , 3.0 KW and 4.0 KW petrol sets gives you freedom to choose what suits you best. Highest rated power output with better fuel efficiency provides more KW per liter of fuel Vis a Vis competition. Inbuilt AVR ensures clean power to the loads and protects the devices from sudden current spikes. Power disruptions can affect your business as well as comfort of your loved ones. Gensets are like insurance against power cuts. KCC reaches you with the widest network of authorized dealers skilled service engineers spread across India. Customers just need to dial our toll free number service will be available at the door step. Rated/Max Power Output (VA) :: 3000/3300 VA. Installation Commissioning :: Labour Free on-site. Product Warranty :: 1+1 Year Extended Onsite Warranty. Compliance :: Latest Government Emission Norms CPCB II. Start Type :: Easy Key Start. Service :: Labour free onsite service under warranty period (420+ service touch points and 6000+ KOEL trained service professionals on field ). Type of Product :: Portable Genset. Rated Current (A) :: 13 A. Rated Voltage (V) :: 230 V.
Frequency (Hz) :: 50 Hz. Fuel Tank Capacity (Litre) :: 12.5 L.
Fuel Consumption (At 50% Load) :: 0.84 ltrs/hr. Fuel Consumption (At 75% Load):: 1.09 ltrs/hr. Fuel Consumption (At 100% Load) :: 1.29 ltrs/hr. Engine Model No :: CCP302. Engine Type :: 4 Stroke OHV. BorexStroke (mm) :: 80x60 mm. Lube Oil Capacity (ml) :: 1100 ml. Sound Level (DB) :: <86dba. Dry Weight (Kg) :: 129 Kg. Dimension (mm) :: 1045X550X735 mm. Features Number of Cylinder:: 1.